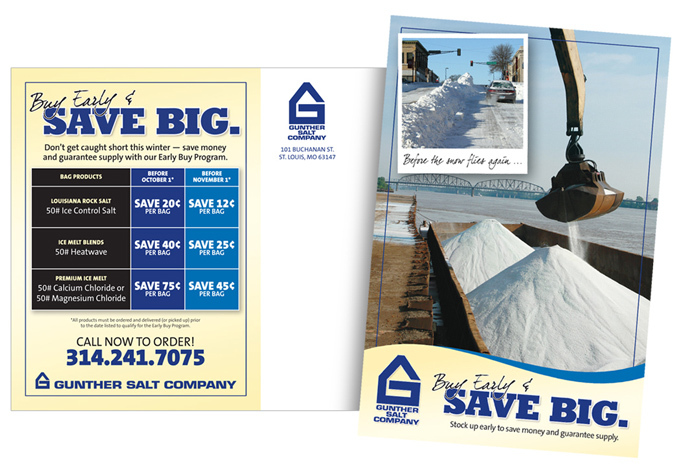 Gunther Salt Company: Direct Mail Card - TriFecta Creative. Graphic Design and Creative Services for Your Business. Wrote and designed pre-season “sale” direct mail piece for manufacturing client. Working closely with company owners, we developed the overall tone and theme of direct mail piece, offering special discounts for early action. We took the client’s initial idea to “communicate something about ordering early” and developed the entire program for them. From preliminary design/messaging ideas to delivery of final full-color postcard, we handled the entire process. Direct mail piece followed in the branding theme we had developed for client in early works … including design, style, colors, fonts and messaging.